Our corporate social responsibility consultants help any size business integrate CSR concepts into their business model to form sustainable corporate self-regulation. Positive outcomes for our clients are exponential, and range from financial gains to improving operational efficiency. The emergence of corporate social responsibility reflects a world that increasingly expects, values and often demands accountability and responsibility for our actions, both as individuals and as businesses. Among many constituencies, how a company conducts its business is as important as the business itself. Social responsibility reports provide a proactive vehicle for telling your story from your perspective. Unlike many types of corporate reports, there is no cookie-cutter approach to social responsibility reporting. Content can range from highly quantitative and audited metrics on sustainability initiatives to human-interest stories that feature community involvement to corporate governance measures that ensure transparency. We work with our clients to help identify desired audiences, gather relevant content and determine effective formats in order to present an accurate portrayal of your company and its commitments. 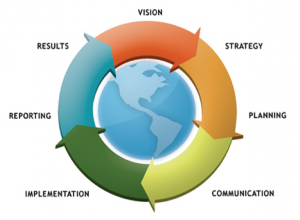 Our Strategic Advice is tailored to each client’s unique business context! Identifying key environmental, social and economic trends, and assessing their relevance to core business strategy and operations. Assessing the business impact of, and societal interest in, the sustainability issues facing a company to guide strategy and/or reporting. Developing robust, company-specific sustainability business cases to help gain traction and prioritize strategic options. Identifying and gauging the strategic, financial and operational risks and opportunities posed by climate change. Surveying the sustainability landscape for key news, reports and events to provide customized intelligence and insights. Guiding clients’ integration of sustainability into diverse corporate functions and management systems. Developing effective and credible sustainability reporting and communications for employees and external stakeholders (e.g. investors, NGOs, business partners). Identifying, prioritizing and managing sustainability risks and opportunities throughout the supply chain. Developing strategic, compelling and credible brand responses to sustainability risks and opportunities. Providing objective and credible evaluations and benchmarks of company sustainability performance and reporting. Designing and implementing assurance processes that bring credibility to sustainability programs and communications.